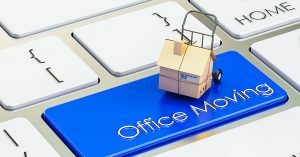 But at the same time, you’ll likely recognize that the period leading up to your office move can often be seen as organized chaos. Moves involve a lot of planning and a lot of details and sometimes it means you may need to store goods in advance of the move or in anticipation of opening your new office. That’s where A.B. Richards can help make things smoother for your business. A.B. Richards rents portable storage containers for all types of uses. If you’re involved in a move and you need a place to store your records, furniture, desks, computers and anything else that may be going to the new location, our storage units will keep them safe and secure. A.B. Richards can help you get organized and smooth things out during your office move. We also want to make things easier by giving you a checklist of must-do items along the way. Notify clients of change of address, contact post office and IRS as well. By now you should have hired a mover and about a month before moving day, you should be looking to procure your storage units for files, furniture or anything else you want to keep in anticipation of the move. About two weeks before the move it’s time to start the final preparations. According to the Houston Chronicle, this is when you should start cleaning you’re soon to be the former office. When you do this, you’ll see that there will be a lot of junk that needs to be thrown out and you may need to store old files and go through them to see what needs to be kept and what needs to be thrown out. Once you know what’s going to the new office, it will be time to pack, tag and label each box and make certain you put each item’s destination on the label. Also, secure any fragile items. Assign tasks for moving day and distribute all of the keys for the new location. Whether you’re moving, need extra space during a renovation, need extra storage for business or industrial use or need to store material or furniture at a job site, A.B. Richards will take care of all of your storage needs. To get started, contact us today.